Trim away the upper most green part of the leek and thinly slice, give it a good wash as this is where most of the dirt will get trapped. Melt the butter in a sauce pan and add the sliced leeks. Add enough water to just cover and season with sea salt. Simmer until tender, then blend to a puree. 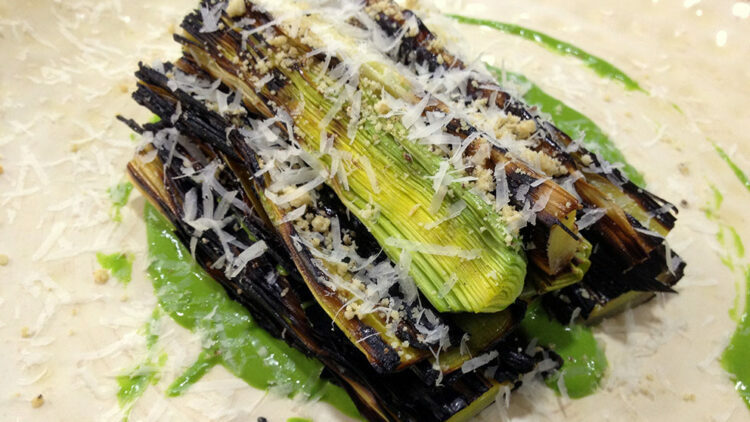 Cut the remaining leeks in half lengthwise and brush with rapeseed oil and season. Cook these in a char grill pan or BBQ on a low heat until good and charred, flip over and do the same to the other side. Do not under cook these, if the outside gets too dark it can be simply peeled away. Add a good amount of the puree to the plate, pile the hot leeks on top and cover in freshly grated spenwood cheese and chopped toasted hazel nuts.